DNG is pleased to introduce 399 Clontarf Road to the open market - a charming and attractive late Victorian five-bedroom semi-detached property with uninterrupted sea views to the front. The house is one of nine original houses, superbly located on the seafront, this is one of Clontarf's most sought-after residential roads. Beyond the distinctive rendered façade lies a warm and inviting home, which has been lovingly maintained over the years and a happy home for many years by the current owners. High ceilings, generous room proportions, elegant reception rooms and well-proportioned bedrooms are further complemented by the private garden with side access. Internally the two reception rooms have elegant proportions and are flooded with natural light perfect for entertaining yet cosy for everyday living. A spacious kitchen leads to a family room at the rear with a downstairs shower room completing the downstairs accommodation. On the first and second floor there are three bedrooms (master including a guest room with ensuite) and a family bathroom. On the top floor there are an additional two original bedrooms. Overall, this is handsome residence providing well-appointed accommodation with the added bonus of a landscaped front driveway with side access leading to a private rear garden. 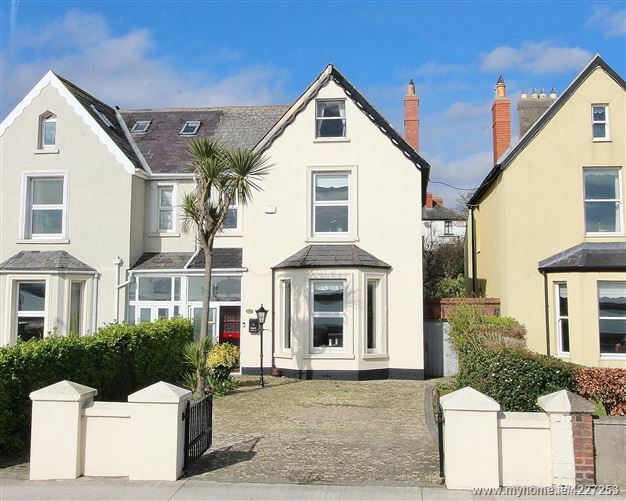 This is a prime residential location situated on the Clontarf promenade with superb amenities close by including a wide variety of primary and secondary schools. A few minutes away from local shops and eateries it is also only a short walk of the main village which is filled with a variety of bustling cafes, restaurants, boutique and speciality shops. Under stair storage, centre rose, ceiling coving. Bay window, tv point, stone feature fire place, semi solid floor. Ceiling coving, centre rose, wooden floor, double doors to garden.